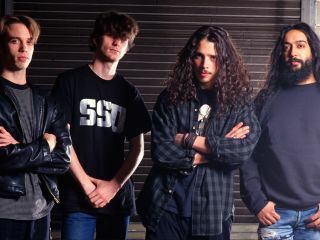 Soundgarden will reunite this year. Yes, you read correctly. Wasting little time to be the first big music news of 2010, singer Chris Cornell confirmed the reunion on his Twitter account at the stroke of midnight EST. "The 12 year break is over & school is back in session," Cornell's Tweet reads. " Sign up now. Knights of the Soundtable ride again!" On the Soundgarden website, a similar message is posted along with a video of the band at their grungiest as they blast through Get On The Snake from 1989. Interestingly, ex-Nirvana bassist Krist Novoselic blogged on Seattleweekly.com last week that the rumor of a Soundgarden reunion wasn't true. He cited what he described as an "excellent source." Throughout 2009, however, all signs indicated that something was afoot. First was the 'Tadgarden' show last March, when former Soundgarden members Kim Thayil, Matt Cameron and Ben Shepherd jammed with guitarist Tom Morello and guest vocalist Tad Doyle. This was followed by Chris Cornell's statements to MusicRadar, when he said, "I'm never going to count anything out. I've always remained on great terms with everyone in the band. We've always been good friends. Seeing them reunite recently on YouTube? I thought that was terrific. It gave me a warm feeling. I wish I could have been there." Finally, there was the Temple Of The Dog reunion last October, when Cornell joined Pearl Jam on stage in California for a rendition of the song Hunger Strike (see below). Soundgarden have yet to reveal specifics (is an album being planned? A world tour? ), but a string of West Coast dates is being talked about as the first order of business. The band is said to be "into the idea" of an appearance at the Coachella Music Festival.